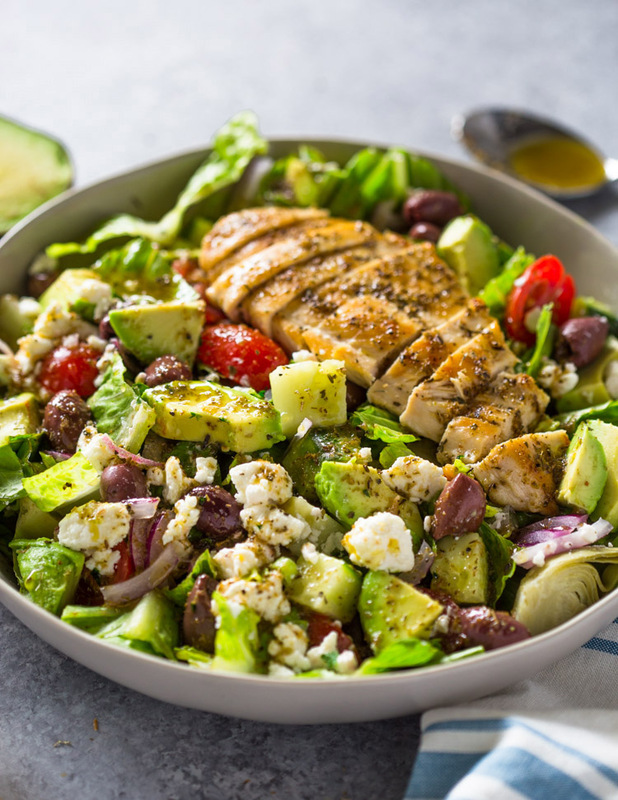 Chopped romaine, tomato, cucumber, olives, artichokes, feta & avocado topped with grilled chicken and dressed with a zesty homemade Greek dressing. 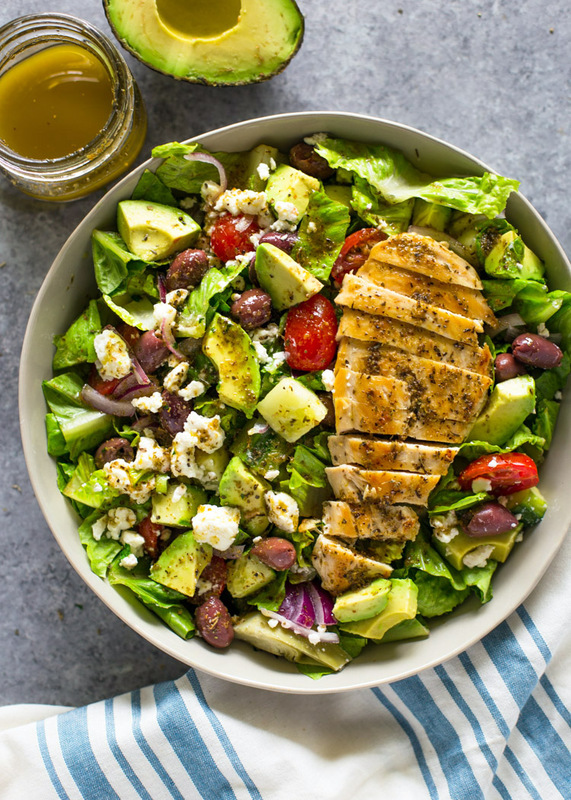 Serve with a side of warm bread sticks and enjoy this flavorful protein packed salad for lunch or dinner! Summer is almost upon us and so is salad season. The temps are beginning to reach the 90s here in DC and the only thing I can possibly think about eating for lunch during the summer is salads. 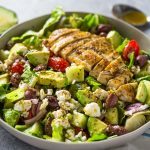 This Greek inspired salad is loaded with your usual Greek salad ingredients with the addition of avocado and grilled chicken. Adding freshly grilled and chopped chicken to salads takes them to the next level making it complete meal. Pound Chicken flat with a meat tenderizer or slice chicken breasts in half to make them thinner. In medium bowl or ziplock bag, combine the chicken, olive oil, oregano, garlic and a sprinkle of salt and pepper. Heat a large heavy duty pan to medium-heat and grill chicken 5-6 minutes per side until tender and cooked through. Remove from pan, cool for 5 minutes then slice or chop. Combine all the ingredients for the dressing in a mason jar and shake to combine. alternately, whisk i s a small bowl. In a large bowl, combine all the chopped ingredients for the salad. Top with chopped chicken a drizzle with generously with dressing. Serve immediately. I like to use fresh grilled chicken that I grill on the stovetop or outdoor grill but any pre-cooked chicken you have on hand will work just as good. Any calories information? Would be great to have this included. Just added the nutritional info! this sounds so yummy!! How many calories per servIng??? Delicious! I made this today and my friends loved it! Thank you! My favorite avocado recipe! Thank you! Healthy and really good taste. This recipe is perfect for me. Thank you! Perfectly arranged ! Hooked 🙂 Thank you so much !